With the weather now quite hot and humid, and the first sign of good rains just around the corner, it is time for wildlife to invest in the next generation. On land, birds of all shapes and sizes are busy nesting and rearing chicks. Large numbers of hanging pear-shaped nests of metallic starlings within a tree appear all over the north. Large colonies nesting in trees can be incessantly noisy with regular comings and goings as both parents busily fly to and fro to feed the ever-hungry brood. Two or three young are raised over the coming months. Yellow-bellied sunbirds have also built their gorgeous suspended, pendulous nests made from vegetation bound together with cobwebs, complete with a hooded side entrance. They raise one or two chicks. Most Torres Strait pigeons nest offshore at this time but a short walk around Cairns Esplanade reveals many birds on nests. 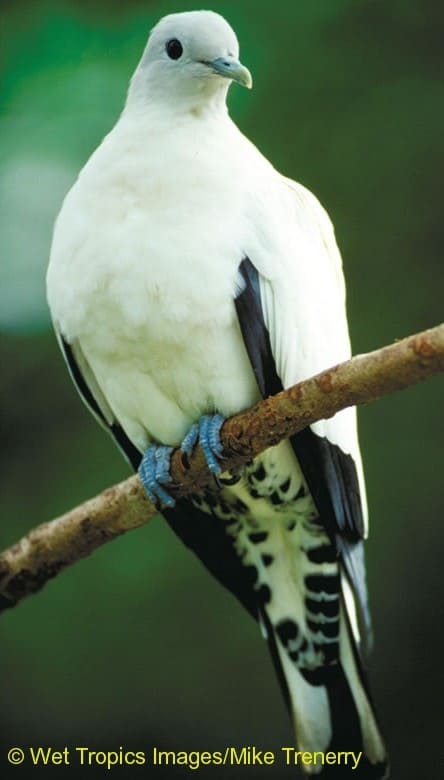 These large, plump white pigeons were the first Australian bird ever described. They migrate from New Guinea every August to breed and lay a single egg in a small fragile nest of twigs. Their call is a deep, booming ‘coo-hoo’ repeated at brief intervals. Take a trip to the Botanic Gardens to see two types of megapode, or mound-building bird, the Australian brush-turkey and the orange-footed scrubfowl. They construct large mounds of leaves, soil and debris to incubate their eggs. During the breeding season a dominant male brush- turkey develops a brilliant yellow wattle and bright red neck. He aggressively defends his mound against other males whilst encouraging females to mate and lay several eggs in the mound. Scrubfowls pair for life and both care for their massive incubation dome – the largest nest of any living bird. Offshore all kinds of wildlife are breeding as well. It is the time for coral spawning, where a mass of eggs and sperm are timed to release after a certain lunar cycle. Many types of coral reef fish also gather in breeding aggregations and take turns in releasing eggs and sperm. On the offshore islands sea birds are nesting in their thousands. On Michaelmas Cay space is at a premium as a large colony of common noddy terns are busy trying to build a nest of leaves, seaweed and guano to lay a single, white spotted egg. In the coastal rivers, swamps and billabongs, the breeding season of estuarine crocodiles has commenced. Large adult males call and perform a complex series of mating rituals to attract females. After mating, the female will lay up to 60 hard-shelled eggs in a mound on a bank hopefully above flood level and guard these for several months.